Admissions Open at Gulab Devi Educational Complex's Main Campus, Lahore for the batch Fall 2018. GDEC offers admissions in different fields of study for Bachelor Programs. 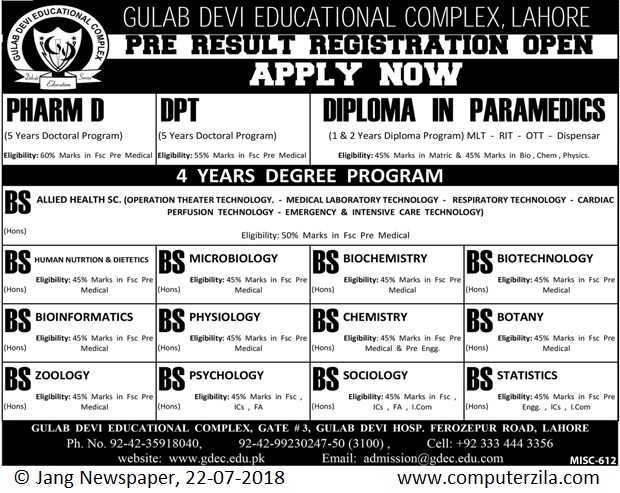 University DescriptionGulab Devi Postgraduate Medical Institute (GPMI), established in 2004, is a postgraduate training institute for medical and health care professionals located in Lahore, Punjab, Pakistan. Gulab Devi Chest Hospital is attached to it as a training and teaching hospital. The institute is accredited for training in FCPS Cardiology by the College of Physicians and Surgeons of Pakistan. PGMI is also affiliated with University of Health Sciences and constitutes Ameer-ud-Din Medical College. fee schedule for bs mlt ??? kindly reply me i waiting ur response Thank you so much...! !